If you came across a group of these tents in a forest you might think you've stumbled on an alien invasion. These incredible tents look as if they are hovering in mid-air and people might think you've been abducted by aliens, because at night they look like glowing UFOs. The spooky tents are the brainchild of treehouse architect Alex Shirley-Smith, 38, who became fascinated with tress after watching a BBC documentary about the destruction of the Amazon when he was just six years old. More than 25 years later, Alex's dream came true when he teamed up with talented tent designer Kirk Kirchev, 40, from South London, to create Tentsile in 2012. Alex, from Tottenham, North London, said: "When I saw the Amazon deforestation my heart hurt. "I knew the only way trees would survive was if they were valued for more than just timber. I knew I had to build treehouses. "In 2001 I started working as an apprentice working by day on elaborate fixed treehouses for elite clientele, and by night on my mobile treehouse dream. "When I teamed up with Kirk he joined my crusade and together we brought the vision to life in a practical, lightweight and super-desirable way." 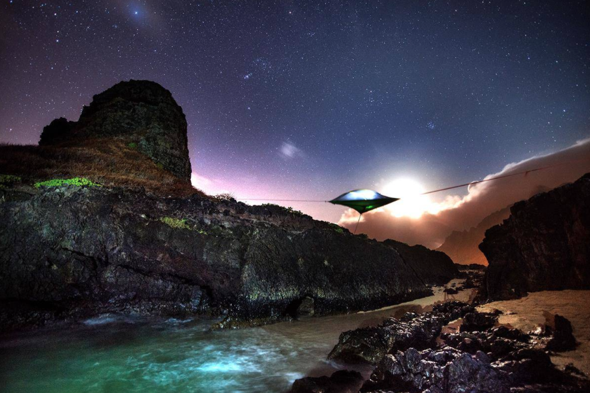 The first Tentsile was sold in 2013, called the Stingray, and since then the company has gone from strength to strength and online sales have quadrupled since the beginning of 2015. Alex said: "It's more than just a tent in trees, it's adventure, secrets, playfulness, mystique and flat-out 'cool factor' manufactured out of nylon. "It's an escape in a bag. "But the benefits of Tentsile reach far beyond its cool factor it's versatile, it keeps warm bodies off cool grounds and it lessens environmental impact. "It makes it possible to camp just about anywhere, without a rock in your back - no more searching for flat ground. "We're pretty sure it'll hold up great in the zombie apocalypse, too!" Take the Twin Coast Discovery Highway from Auckland to the beautiful Bay of Islands, where you can take a boat cruise, swim with dolphins, dive, fish or just chill out in the sun. North of Russell, around Tapeka Point you’ll see an abundance of wildlife including penguins, dolphins, marlin, whales, gannets and more. This subtropical Northland region of New Zealand is known for its history as well as its stunning beauty. Visit the Waitangi Treaty Grounds, New Zealand’s most significant historical site and learn about the Maori culture and the historical events associated with the signing of the Treaty of Waitagni between the British Crown and 500 Maori chiefs in 1840. There are many beautiful spots to camp - but stick to conservation camping grounds or campsites; it is a misconception that you can free camp wherever you want in New Zealand. If you want to take your own camping equipment, make sure you’re up to speed with airline regulations first. One of Canada’s oldest and largest national parks, Jasper is the gentle giant of the Rockies. Chill out mountain style or head off on an adventurous journey along 1000km of trails. Jasper's elevation range, geology, geography and climate create diverse habitats for a massive array of wildlife. Prepare to share your home for the night with animals including elk, deer, moose, caribou, bighorn sheep, mountain goats, bears, coyotes, wolves, beavers, pine martens, lynx, porcupines and wolverines to name a few. There are plenty of camping grounds with firewood, bear proof lockers for safe food storage and log cookhouses at your disposal. One of Africa’s greatest wildlife reserves, Maasai Mara, has a world-renowned eco-system. Its 1510 sq km of rolling grassland provide a home for lion, leopard and cheetah, as well as elephant, buffalo, hippo, zebra, giraffe and gazelle. In July and August millions of wildebeest move north from the Serengeti in the great wildebeest migration. Over 1.4 million of these beasts and 200,000 zebra and gazelle, relentlessly tracked by Africa's great predators, migrate over 1,800 miles each year in search of lush grassland. Enjoy beautiful sunsets and meals under the stars on a safari tour. Many include luxury tents, with en-suite bathrooms with hot and cold running water. Yosemite National Park in Central California’s Sierra Nevada mountain range offers an incredible 1, 170 square miles of breathtaking scenery with beautiful valleys, tumbling waterfalls and the iconic Half Dome, a rock rising nearly 5,000ft above Yosemite Valley with the sheerest cliff in North America. Climbers come from around the world to climb its legendary north face. You can also hike up to the summit via a 17-mile round trip from the Valley. The hike is famous for the section where walkers need to ascent using cables. The two metal cables allow hikers to climb the last 400 feet to the summit without rock climbing equipment. The trail can be done in one day or made more enjoyable with a break to camp along the way (Little Yosemite Valley is the most popular spot). Enter a different world of blue and white wilderness, breathtaking peaks and glaciers, powerful waterfalls and rivers in the Vatnajökull National Park. Hiking is the best way to see the park’s wonders and protected areas. Guided tours are operated from Skaftafell, including the popular glacier hikes on the stunning Falljökull. No ice climbing experience is needed for many hikes which will allow you to experience the great Icelandic glaciers and waterfalls. Visit Jokulsarlon, the most famous glacier lagoon in Iceland, stretching 18 square kilometres with a depth of about 250 metres, from which you can see the Northern Lights when the sky is clear. Due to glacial retreat, huge pieces of ice break loose from the glaciers and end up floating in the Jokulsarlon lagoon. Camping is a great way to enjoy the park and will serve you better than hotels of which there are few near the park. The iconic outback landscape of The Kimberley in Australia is one of the last true wilderness areas on earth and makes for an unforgettable camping experience. The Kimberley is home to only 40,000 people meaning that there are fewer people per kilometre than almost any other place on the planet. The northern regions of the state are a treasure trove of spectacular landscapes, isolated lakes, lazy rivers and white and sandy beaches. In the World Heritage listed Purnululu National Park you’ll discover the stunning orange and black striped domes of the Bungle Bungle range which were known only to a few Australians before 1982. If Heidi was alive you’d find her in this pristine and uplifting corner of the Swiss Alps. Presided over by the glacier-encrusted mountains of Eiger, Mönch and Jungfrau, the Jungfrau Region offers hundreds of kilometres of walking trails from which to capture the astonishing scenery. The gushing waterfalls and crystal-blue mountain lakes provide welcome refreshment. If you’re less keen on walking, head up the sheer slopes of Jungfrau Mountain, a UNESCO World Heritage-listed site, on Europe’s highest railway and breathe in the spine-tingling views. To combine camping with an organised tour, contiki.com offers holidays which incorporate the region. A 130-mile-long string of islands lying off the northwest coast of Scotland, characterised by a unique landscape of vast vistas of sky and sea, dazzling white beaches, wildflower-speckled machair (grassy sand dunes) and rugged hills and lochs. The islands’ Gaelic speaking communities run at their own pace, with morning papers arriving in the afternoon and many shops and pubs, especially in the Protestant north, shutting their doors on Sundays. Explore the remnants of a fascinating past through the prehistoric sites and preserved blackhouse (stone cottages with turf roofs and earthen floors) and enjoy the islands assortment of arts and crafts studios. Make the most of Scotland’s access legislation which allows you the freedom to wild camp on most unenclosed land. Take a spiritual journey on a trek to the foot of Everest, the world’s highest mountain. The National Geographic runs a 14-day Himalayan trek to Everest’s Southern Face Base Camp through some of the world’s most spectacular mountain scenery. Discover the historic treasures of Kathmandu, stay in villages set against soaring, jagged pinnacles; get to know the unique culture of the Sherpas; and walk trails lined with mani stones, engraved with Tibetan Buddhist prayers. Uncover remote mountain monasteries and learn about the Sherpas’ spiritual perspective on the mountains they call home. The memory of walking in from the Inti Punku – the Gate of the Sun – is rarely forgotten by hikers who take on the challenge of South America most famous. Combining beautiful mountains, lush cloud forest, subtropical jungle and a fascinating mix of Inca paving stones, ruins and tunnels the trek reaches 4,000m. While a few days acclimatisation is recommended, the varied choice of routes mean most active people can find a suitable trek. They usually last four days and include a guide, a team of porters, food and wild camping.